It looks like it’s going to be another busy year for Mercedes-Benz with a variety of key new products being unveiled at the German manufacturer’s press conference today. Headlining the event is the all new V-Class, the successor to the current Viano. Keen to lose its commercial vehicle ties, the new model takes design cues from the recently launched S-Class and the new C-Class and will be available as a six-, seven- or eight-seater vehicle. It still offers the functionality of a van, though – Mercedes proved this by driving onto the stage with a four-piece band inside the V-Class, complete with a double bass who then hopped out and began playing. The interior includes aspects of the new C-Class and S-Class, including their touch pad control system which Mercedes says has been customised specifically for the V-Class. To help improve efficiency and lower emissions, the new V-Class will only be available with a 2.1-litre diesel engine with a choice of two different power outputs; 160bhp and 187bhp. Production of the V-Class started yesterday in Spain. "Having been taxied to the show in a current Mercedes Viano, it was interesting to compare its interior with the new V-Class. The swoopy dashboard design cues influenced by the S-Class and new C-Class are far more modern and attractive and the graphics on the multimedia display screen are crisp and smart. The screen's widescreen shape makes it look less of an afterthought than the tablet-shaped screen in the A-Class family, too. "The touchpad and rotary controller for the infotainment system are very easy to use, although after several hundred motor show goers had used it the gloss-black surface was plastered in greasy fingerprints - might be hard work to keep clean, like an iPhone." - James Taylor, Staff Writer. Following on from the success of the new S-Class, a coupe version is hot on its heels. This new high-performance model takes the latest technological advancements from its saloon counterpart. There will be one engine available but sometimes one is all you need with the 4.7-litre twin-turbo V8 petrol engine on offer here which produces 449bhp and peak torque of 700Nm. The Coupe gets all the technical highlights of saloon plus an advance Head-up-Display and increased touchpad functionality. There’s also an intriguing ‘Carve Tilt’ suspension function, which tilts the suspension struts automatically to lean certain wheels toward the inside of the corner, in a similar way to that of a skier tilting their skies. Mercedes says the S Class Coupe ‘drives as good as it looks’ – so we can expect it to drive very well indeed. 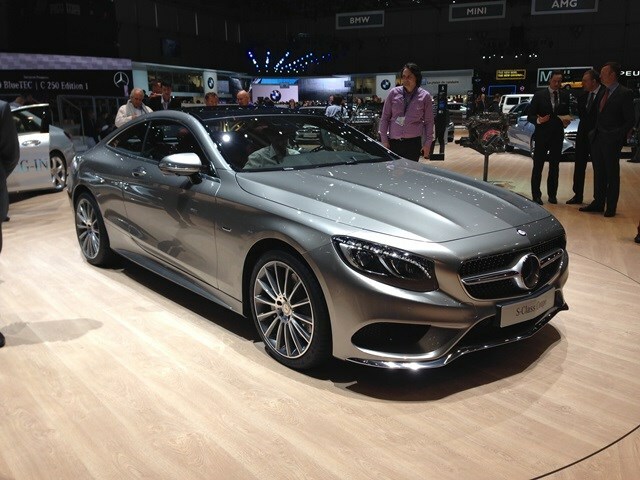 Order books for the new S-Class Coupe will open in the summer with first deliveries expected by the end of the year. As if the S-Class and S-Class Coupe weren’t enough, fresh from its world debut at the Detroit motor show, the new super powerful and luxurious top of the range S 600 has made its European debut here at Geneva. Producing a staggering 523bhp, the S 600 with its V12 bi-turbo engine is available exclusively with a long wheelbase. Proving that Mercedes-Benz can offer performance as well as economy, the new S 600 features Stop/start for the first time as standard, which contributes to the car reaching the Euro 6 emissions standard. The combined official fuel consumption stands at 25.4 mpg – a 21 per cent improvement over its predecessor. It's also equipped with the acclaimed ‘Magic Body Control’ system as standard. Not only that, there’s also the monstrous S 65 AMG performance car, with a 6.0-litre bi-turbo V12 engine churning out 620bhp and a frankly ridiculous 1,000Nm of torque, yet still complying with the tighter new Euro6 emissions regulations. It features a lightweight body construction, partially in carbon fibre and the fast-shifting seven-speed AMG Speedshift Plus 7G-TRONIC automatic transmission, its first pairing with a V12 engine in the S Class. 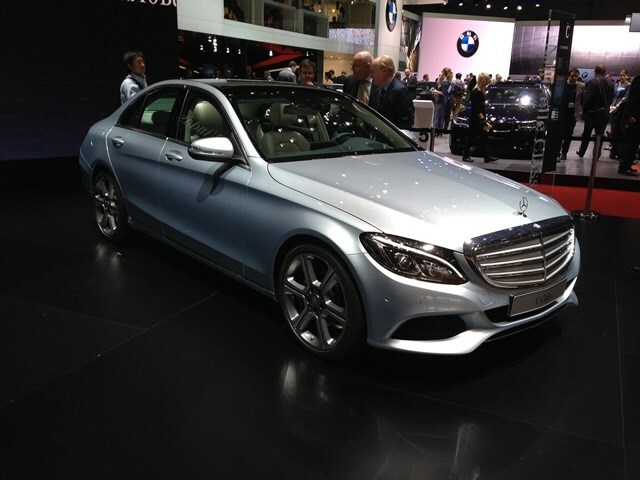 Alongside these new models is the new C-Class which is only months away from arriving in UK showrooms. One of the most popular and hotly anticipated cars of 2014, the new C-Class shares many of its characteristics with the recently launched S-Class, including a significant upgrade in interior quality as well as introducing new technology including a pretty cool new touchpad system which works like a smart phone. Two engines will be available when it gets to the UK along with the usual three trim levels. We will be driving the new C-Class in just over a weeks time so key an eye out on the Parkers site for our full review. If you cannot wait till then, find out all the latest on the C-Class by reading our preview here.